I bought a few Milkweed plants so I could attract and photograph Monarch butterflies. I planted the plants in my yard and the Monarchs showed up within days. I was thrilled and spent as much time as I could watching and photographing them. When I saw one of the females laying eggs, I was really excited. I could just imagine seeing an egg get all the way through the caterpillar and chrysalis stages and witnessing a new butterfly emerge. I saw the tiny little caterpillars and then I saw a Mom bird stuffing one after another of my caterpillars down her hungry little baby's throat. Oh well, birds have to eat too. And there were plenty of eggs, so I'll share. Finally I had a few caterpillars getting larger and I was out in the yard watching them crawl around and consume my plant. I was keeping an eye on a pesky Paper Wasp (yellow and black striped body)that kept flying around me. Much to my surprise, the wasp attacked, killed and ate the caterpillar. I had no idea they did that. That's when I started searching on the internet to see if I could bring the caterpillars in the house and keep them safe from predators. I found your site and I now have a vase with a branch of milkweed in it and one of the caterpillars. I will be looking for more. This is a wonderful site with great information and references! Thanks so much for providing it. I have a lot to study and learn, so the references you provide are just what I needed. I have six monarch cats and I have been hovering like a mother hen around them just to see 5 wasps show up. I noticed they were only eating the nectar on the flowers. I prayed and prayed...how am I going to get rid of those wasps before they ate my cats? I was chasing one with wasp spray when all of a sudden--prayer answered. Cut off the flowers. The cats eat the leaves. So, I cut off the flowers and no more wasps! Isn't the Lord good? You can always go to a second hand shop and buy a single mosquito net (the ones that people put over beds)....gives your plants and babies great all over coverage and the cost is cheap. Keeps the pests and birds away. Yes, today I witnessed a wasp attack my monarch caterpillar. I had this problem last year in June, but I hit the wasp with a newspaper and killed it after it ate a caterpillar. I then went around my house and found a nest and I sprayed it with a good insecticide. In March, I had 30 caterpillars and 25 of them made it to the chrysalis stage. And all of the butterflies emerged and flew away with no problem. But now this month, I have a butterfly that keeps laying her eggs but I noticed yesterday that my caterpillars were hiding close to the ground under a couple of plant leaves that were not even milkweed leaves. And one was dead with a sting black mark on its back. So, I found most of the caterpillars and brought them inside in these netting containers that I bought in the garden department at a store. I could order a castle but that is for potted plants. What can I use for plants that ate on the ground? Karen...I am in my third year of raising Monarchs on my milkweed and it has been a terrible one. My routine is once the cats were mature and ready to attach to form chrysalis, I would put them in my butterfly net cage for safekeeping till they became a butterfly. This year the wasps have decimated the cats. They patrol my milkweed like soldiers and get every last one. If I manage to get tiny ones, bring them inside, they grow for awhile, almost to maturity, then start falling off and dying. I haven't had one healthy Monarch this year since early spring. In regard to the wasps, I realize because I had so many cats in my yard, they knew where to come for a good food supply, never had this many wasps before. I've used wasp deterrents (no poison) without success along with catching and killing as many as possible, but they keep coming. 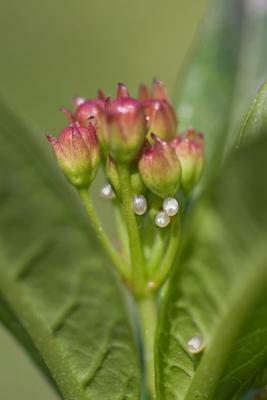 I am suspecting OE for the cats dying...did some research from a university and one suggested the OE is prevalent on my milkweed, etc. I am venting here, but really would appreciate your insight and any suggestions to all this. I have had to turn a blind's eye to my garden and miss the cats. Not sure what to do at this point other than letting nature run its course and questioning whether I want to do this anymore. Thank you, Karen. Very frustrating I am sure. I am not sure what the answer is. Do any of my readers have any ideas or experience to help Maureen? Interesting Information and Beautiful Photo! Thanks for the kind words about my website. I hope you can learn something useful and enjoy your experience of raising butterflies. And, by bringing them inside, you will be saving some Monarchs.